In Week 4, the fundamental question that #ocTEL asks is “how can we take advantage of technological developments in order to create and source relevant learning resources?” Actually, the question continues “for our students”, but I’m going to ignore that bit. I’m just going to throw in here the idea of “self-organised learning” and, on the very same subject, quote Steve Wheeler in his blogpost today, when he refers to “the ability of the learners themselves to direct their own learning, and to be able to call upon the resources they need, when they need them”, before I move on to relate how I’ve engaged with the question and with this week’s activities. if you know how to search it, then it’s actually very good. […] there is a rake of useful stuff on there, lots of it free, but how to search isn’t obvious at all. And on that score, Imogen kindly enlightens us. 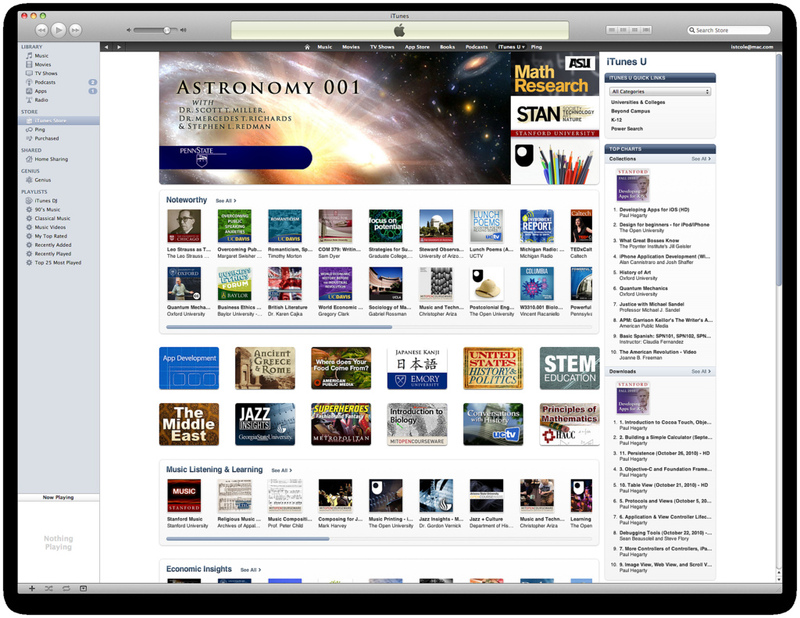 iTunesU. You need to learn how to search it. She also declares that “YouTube rocks!”, and attributes this to its great search engine. It’s an excellent post, with a great follow up conversation, but my point is this: with the likelihood of such patchy results, why bother to go looking for such content in the first place. 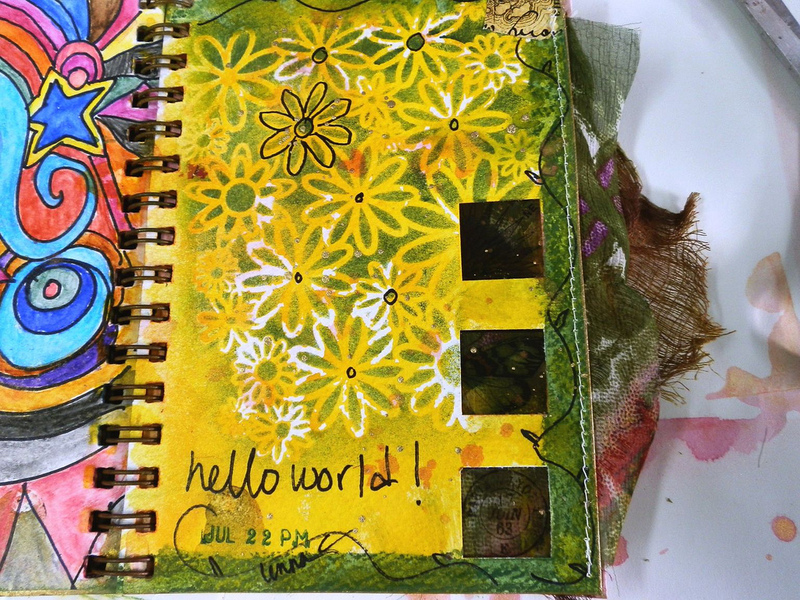 Wouldn’t it be handier to have a filtering system in place whereby relevant resources come to you. I mean, why not harness the power of your personal learning network [PLN]? In terms of context, I paddle my own canoe. I’m an individual (tutor, facilitator, guide, learner…) who simply wants to develop online learning resources that add interest and stimulate interaction with the learning experience. Consequently, I need “low-threshold, low-barrier” technologies that are easily learned and easily accomplish my teaching and/or learning objectives, and more often than not, have sharing and collaboration features built-in to them. Enhance Your Online Conversations With Jing. Jing gives you the basic tools to start sharing images and short videos of your computer screen. The tools I require need to be intuitive and easy to take up in the first instance, maybe with the option of progressing to more advanced capabilities over time. In fact, I just recently used Screencast-o-matic to produce a presentation for another course I’ve been taking, and I found it to be very straight forward and easy to use. I can certainly recommend it. Co-incidentally, the presentation was on the topic of personal learning networks and how developing a PLN has helped me learn and make progress towards my learning goals. I’ll provide the link here, in case anyone would care to take a look. Ooh, this is sneaky. After three weeks, I’m jumping back into the #ocTEL MOOC. I’m fortunate in that this week the course comes to the end of Part I, the Foundations of Technology Enhanced Learning (TEL), so I’m just going to quickly post about the brief interactions I’ve had and the insights that I’ve gleaned through my “legitimate peripheral participation”. 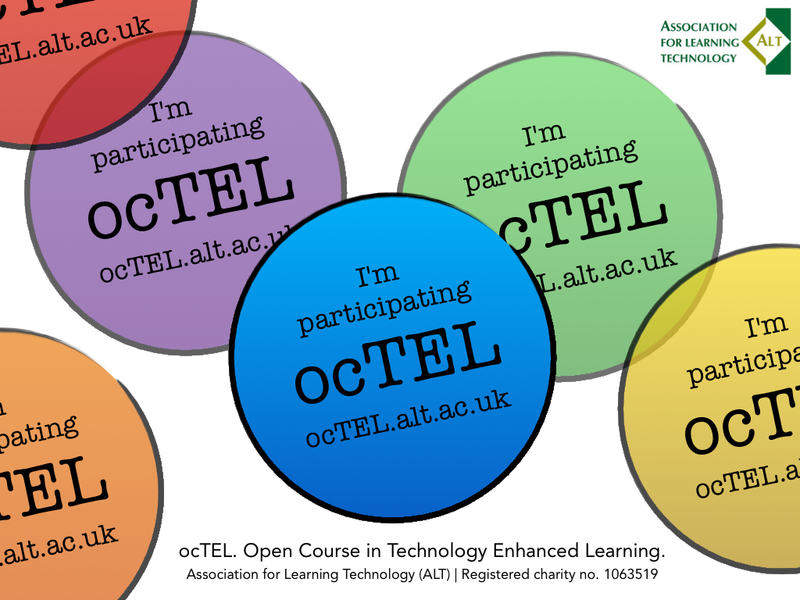 Legitimate Peripheral Participation: #ocTEL MOOC. The challenge for week 1 was to see what doing a course, or taking up a learning opportunity feels like, and to get a feel for the learning landscape and the underpinning theories of TEL. 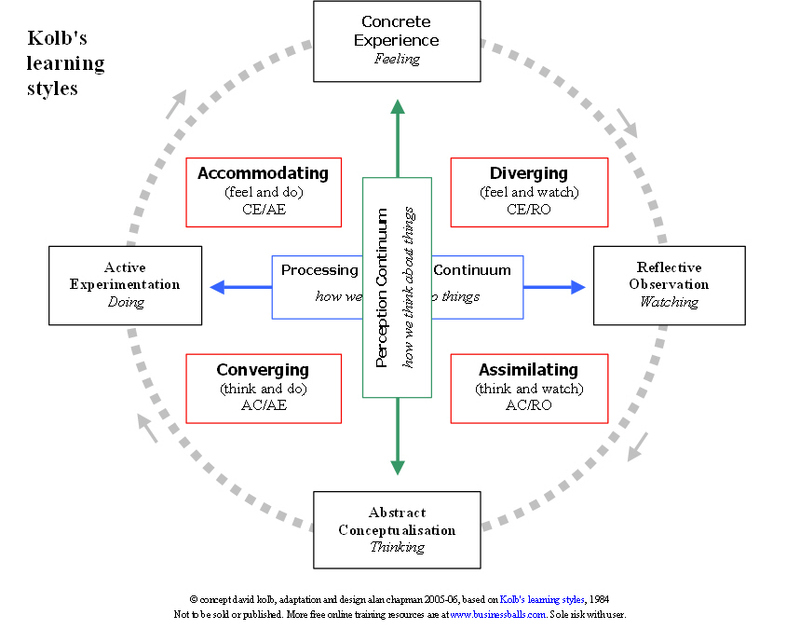 I was intrigued by Helen Blunden’s post where, having looked at the learning activity graph, she identified herself as a ‘social autonomous’ learner. What struck me, when I looked at the learning graph, was that it seemed to be the activities that helped to define the type of learner. I would have said that I’m a social autonomous learner too, but looking at the activities it had me pegged in the individual autonomous learner category. Blogs, dissertations etc., yes, that’s me alright. However, the activities denoting a social autonomous learner were pitched as collaborative commentary on resources, group projects and problem solving; well, I can do those too. So I’m not too sure that the social – individual binary is that big a deal; it looks to me like it’s a matter of context. In my opinion, what’s more important is the difference between directed and autonomous learning and where one is on that journey. I’m glad that I read and commented on this post because a useful discussion developed as Phil Tubman joined in as well. He made the point that assessment often drives the type of learning activity. Definitely! I’m all for a pre-course readiness questionnaire, or initial assessment, and not just in terms of gauging access to technology and time management skills either, but to gauge actual levels of skill; that is, skill in relation to computer literacy, digital literacy and academic literacy. Initial assessment would be used to indicate general levels, but what I think would be really fantastic is then to carry out further diagnostic assessment and really identify a student’s specific skill set; that is, can they demonstrate basic use of a range of tools and sites for finding and recording information online, can they cite in text references etc. That way, you’d get a better picture of an individual, often with what amounts to a ‘spiky’ profile. Furthermore, you’d not only know where the majority of the class was starting from, but you’d also know their individual strengths and weaknesses too. Be it online or face-to-face, I think this would be really helpful to both lecturer and student alike. After all, a readiness survey is a bit late once you’ve enrolled on a course. And it can’t be a surprise that I advocate this type of readiness questionnaire/initial assessment because it’s common practice in adult literacy teaching, where you just don’t know where individuals are starting from. This week’s topic centres on designing active learning, with the “if you only do one thing” activity, asking “what is learning?” In order to answer the question, you’re asked to think about the last time you learned something; describe what you learned; how you went about learning it and what strategies you used. A table, with an overview of categories of learning “suitable for instructional design planning”, was provided to help stimulate thinking. Well, I’m happy that I’ve caught up with the course, but as yet I haven’t browsed the comments of others this week, and I’m wondering if anyone else, like me, is struggling to clearly decipher and be inspired by either the table or the question. Never mind, a quick look over this blog in recent weeks and months is enough to tell you that I’m an individual/social self-determined learner. I’ve learned facts and concepts (know that), I’ve learned procedures, picked up inferences and made deductions (know how), I’ve learned how to participate in online environments (knowing in action) and I’ve identified learning goals and have strategies in place to achieve these goals, and I can also reflect on my learning (elements that could intervene in all the other categories). I have learned to learn. I think what’s bugging me about this question is that there’s an assumption that it’s up to someone else to design your learning. Wouldn’t it be better if more emphasis was put on learning to learn and individuals were able to design their own learning pathways. Imagine that! !